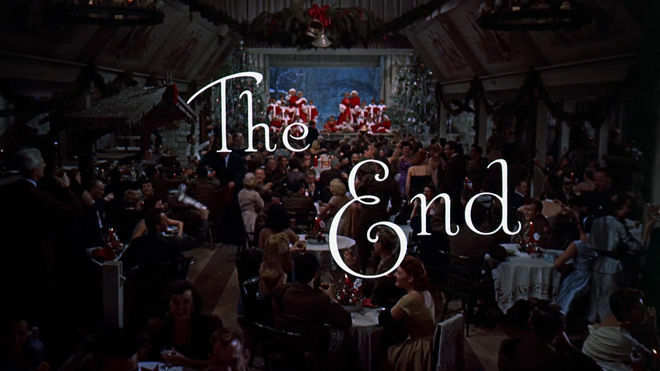 In October of 1954, when White Christmas was released, it was advertised as “the most fabulous music-and-mirth show in motion picture history!” and it certainly was. 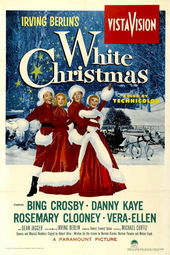 Starring Bing Crosby, the number one box office star at the time, and Danny Kaye, the number three, and featuring the most successful song in American history, it’s no surprise that Irving Berlin’s White Christmas was the highest grossing film of that year. 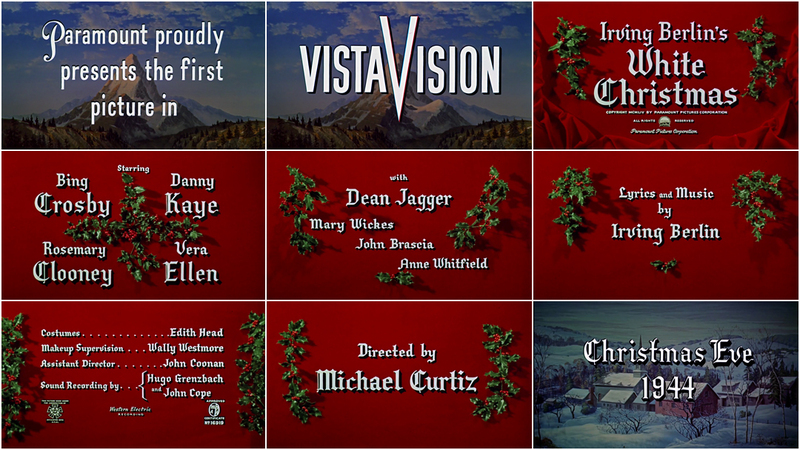 Additionally, as the title sequence announces, it was the first movie to be shown in Paramount’s new VistaVision format. This was a higher resolution, widescreen variant of 35mm film created by engineers at Paramount Pictures that allowed the projection print to have a finer grain. This can be seen right off the bat in the background for the Paramount logo, which was created especially for the wide-screen projection and appears more realistic and has more depth than before. It was more clear, more sharp, and the expanded width gave a greater feeling of depth. The difference in the format came from the way that film passed through the VistaVision camera – horizontally instead of vertically, exposing an area measured by eight sprocket holes for each frame of negative instead of four, which was the standard at the time. The result was an exposed area that was almost three times as large as that of a negative passed through another movie camera. Plus, movies made in the VistaVision format were easily disseminated. They worked with standard 35mm film projectors, making them compatible with existing theatre systems. It’s surprising, then, that VistaVision as a format only lasted about seven years in the American market. As film stocks with finer grain and anamorphic processes such as CinemaScope began to appear on the market, VistaVision was quickly overtaken. Paramount dropped the format in 1961, but it lingered on in a handle of films, particularly in European and Japanese productions. In the 1970s, its influence could be seen in the new 70mm film formats that emerged: IMAX and OMNIMAX, both of which are oriented horizontally like VistaVision was. It also found a home in special effects process work, beginning with 1977’s Star Wars, and appearing in effects-heavy films including Back to the Future (1985), True Lies (1994), The Matrix (1999), Scott Pilgrim vs. The World (2010), and most recently Interstellar (2014).